October 14th – Here’s What Happened! Today was our first tefilah (worship) for K-3 students. This is a great time for us to come together, learn new songs, new prayers, and pray as a community. Kindergarten devoted much of our time together discussing the core of our curriculum – “Love Your Neighbor as Yourself” (Leviticus 19:18). We also had our first music class with Benny and we finished up some kavod (respect) and Sukkot art projects. First Grade learned about creation and although humans were last on the scene, we have the responsibility of caring for the world. We also learned that there are consequences to our actions. Adam and Eve serve as examples of what happens when we do not follow rules. It was fun putting together the story of creation – the children made a magen david (Star of David) with the six days of creation depicted on each of the points of the star and Shabbat appears in the center of the star. Second Grade learned about compassion (rachamim), one of the core values of study this year. They also started their Hebrew curriculum, looking at their class book and talking about the directionality of Hebrew (right to left). 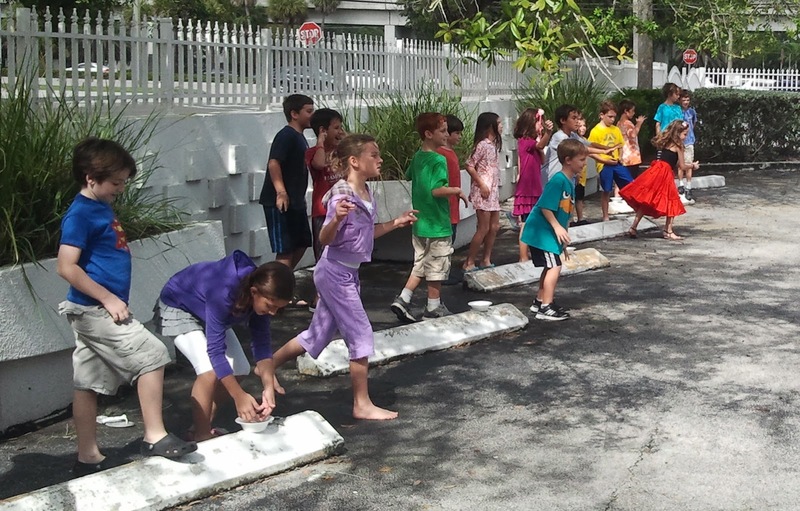 Third Grade competed in the first ever Negev Olympics – after learning how much of Israel is desert and about our ancestor Jacob. Our Hebrew vocabulary is growing as we added two new action verbs today. 4th-6th grade started the “Tefilah B’Kitah (Prayer in the classroom)” program where they will be exploring themes and ideas of Jewish prayers. Fifth grade Hebrew was all about review – the Hebrew vocabulary learned so far this year as well as key phrases from the V’ahavta prayer. Maddy & Justin started their Judaic Studies student exploring the concept of Welcoming Guests, while Sarah’s class created review games to help them master the books of the Bible! Sixth grade Judaic Studies looked at how teens in Israel are like us – the sports they play and the food they eat. Tefilah B’Kitah launched with discussions on the students’ thoughts about God. Third Grade Negev Olympics are Under Way!